Today I am delighted to welcome back Anna from Download and Print with this gorgeous Christmas DIY Tutorial. 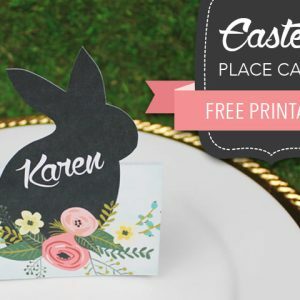 As you know Anna is a regular to the blog and alway offers up some great ideas that have proved incredibly popular with you all. Today she shows us how to make these super cute Memory Journal Christmas Ornaments. 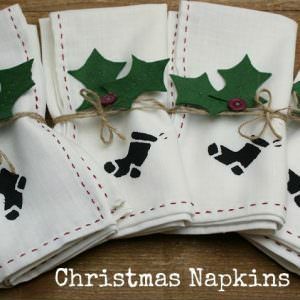 These are so easy to make and would make a lovely addition to your Christmas tree. I’ll pass you over to Anna………. Ho ho ho and Merry Christmas! Today I’m sharing my annual Christmas printable. Christmas is my favourite time of year, but it never fails to scare me with how quickly it rolls around. 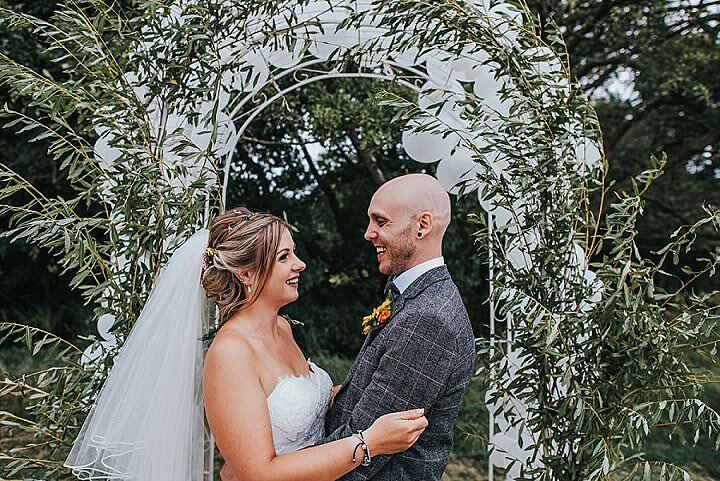 I remember so clearly sitting here writing my Christmas post for Boho Weddings last year and the time since then has passed with lightening speed. Life is so hectic these days and moves so quickly that days, weeks, years can blur together. For me it is important to take time to reflect on what’s been happening in my life, and what better time to do this than at Christmas. This is the inspiration for today’s template. 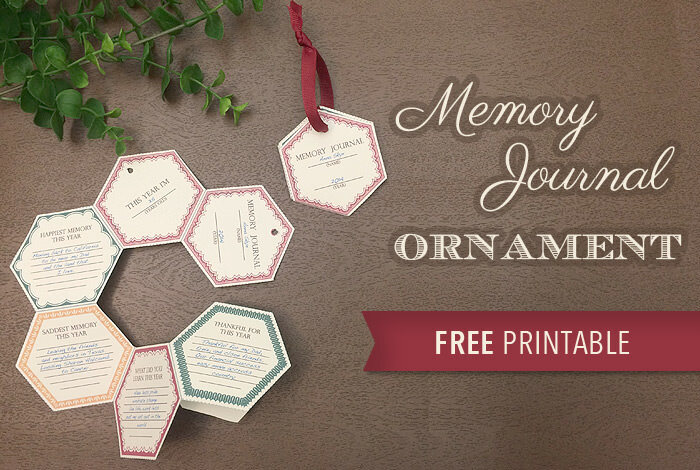 It’s a Memory Journal Ornament, and as always is free for Boho Brides. I’ve had a very happy, and memorable year, sprinkled with pangs of sadness. My family was able to move cross country to be close to my Dad, something I’ve been working toward for years and the stars lined up for us and we made it happen in 2014. Leaving behind good friends definitely raised mixed emotions though. My little business continues to grow and I’ve had wonderful professional opportunites, meeting some inspiring people along the way and making new life long friends. I’ve certainly no complaints and I thought documenting these highlights in a memory journal would be a fun Christmas activity. Bring out the eggnog, light the fire, and gather loved ones for laughter and memories. The ornament is a very simple craft for everyone to enjoy. Gather memories each holiday season to hang on your tree. Or simply collect the memories in a festive box and make it an annual tradition to sit and read through past years while writing new memories. The easy steps to make the ornament or outlined in the video, or follow along with the written instructions below. 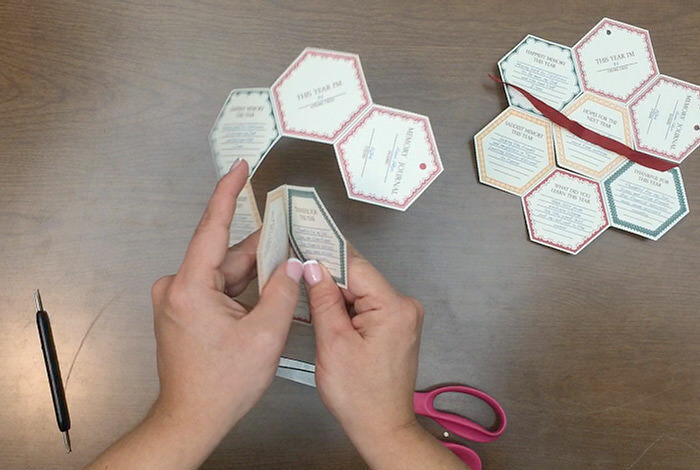 Step 1) Write in Your Memories – Download the ornament template and print copies for each family member joining in this activity. 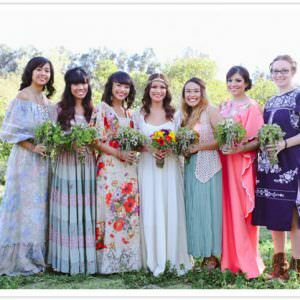 You can print copies for future years to keep on hand, or save the file to print each year. Fill in the spaces on each panel with your reflections from the past year. Enjoy this process. Share your memories with family and friends, creating a warm and thankful atmosphere. 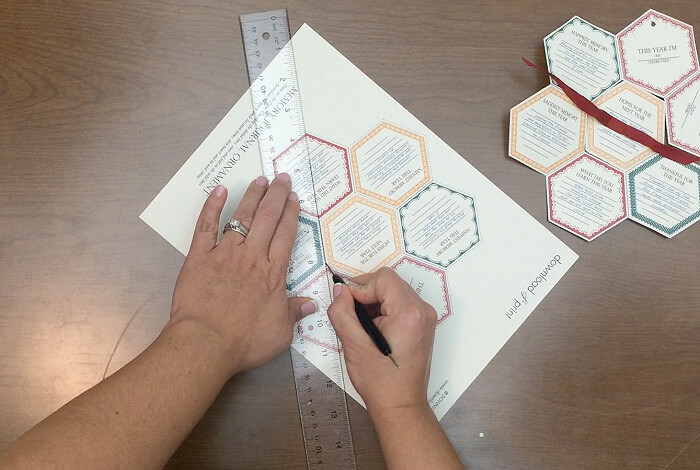 Step 2) Score – The critical instruction is score and fold on the solid line, trim on the dotted line. Use a scoring tool and ruler, or any pointy but blunt object that you have on hand to score along the solid lines. A closed mechanical pencil or back of a utility knife will also do the trick. This starts the fold and makes for nice, sharp creases. It also makes folding the ornament much easier, so don’t underestimate this step. Step 3) Cut – Cut along the dotted lines. First cut the outline of the ornament. Then look for the one dotted line zigzagging through the ornament and trim along this. 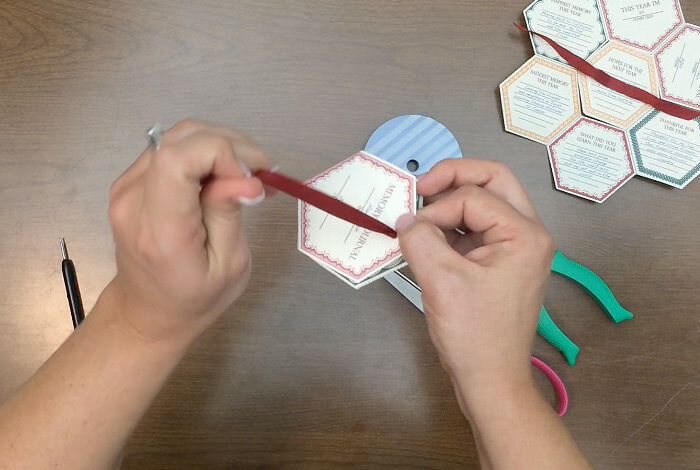 Step 4) Fold – Accordion fold the ornament using the creases you previously made. You will end up with a red panel on the front and back. This is best explained in the video if you want to take a look at the fold pattern. Step 5) Punch – Punch a hole in the front cover using the punch mark as your guide. Flip the ornament over and punch a hole in the back cover in about the same spot. The holes do not need to line up perfectly, and you do not need to punch through all the panels. Doing this runs the risk of punching out some of your memories. Step 6) Tie Ribbon – Thread a length of ribbon through the hole on the front panel, over the inside panels, and out the back hole. 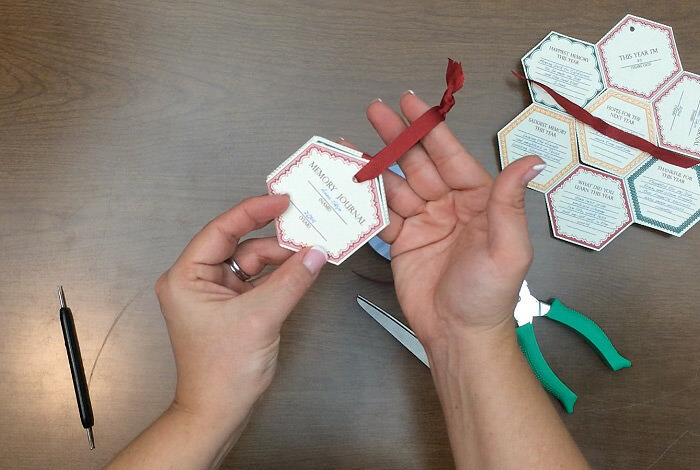 Tie the ribbon in a loop to hang on the tree, or in a bow for easy opening. Enjoy the rest of the evening with your family. I hope it involves hot spiced cider and lots of laughter. Happy Christmas.